A traditional flower garden in a blend of English Cottage and Arts and Crafts style. This video is closed-captioned in English and Spanish. Este video tiene subtítulos en inglés y español. Farrand described the Fountain Terrace as the one real flower garden of the terraces leading east from the house. Two paths from the Rose Garden terminate in iron balconies suspended over the borders of the Fountain Terrace ten feet below. Twin sets of flagstone steps lead to a landing with an oak and metal bench set beneath a lead and iron baldacchino. Above the bench is a plaque commemorating Matthew Kearney, the Irish-born superintendent of the gardens from 1949 to 1973. On the stone walls at the base of the staircases are reinforced concrete jardinières made in the 1920s by Maine potter Eric Ellis Soderholtz. 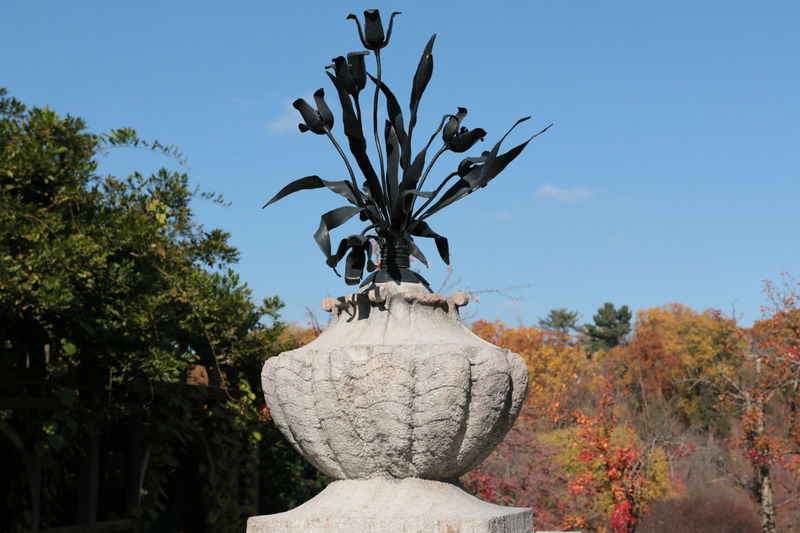 For the beds within the stone walls surrounding the Fountain Terrace, Farrand recommended a combination of flowers in shades of yellow, bronze, blue, and primrose, beginning with tulips in the spring followed by annuals in the summer and ending with chrysanthemums in the autumn. In the central lawn are two limestone pools, each featuring a lead sculpture of a putto holding a fish that spouts water from its mouth. In contrast to the earlier flagstone of the Rose Garden and the brick walkway of the Beech Terrace, the walkways within Fountain Terrace are turf. Ornamental vase and flowers (pair), Aquia Creek sandstone and iron, Beatrix Farrand; carved by Frederick Coles, ca. 1932–35. 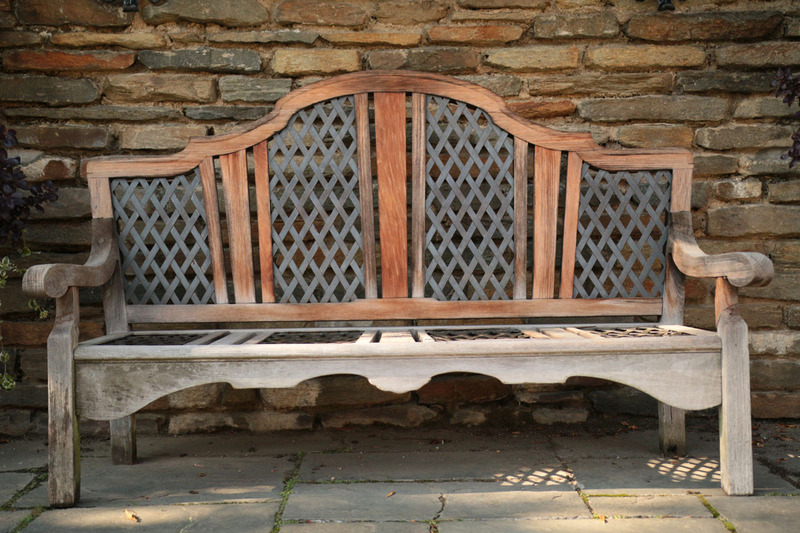 Garden bench, oak and aluminum, Beatrix Farrand, ca. 1933. The wide, shady branches of an enormous beech tree stretch over this quiet enclosed space. The Urn Terrace serves as an ivied transition between the Beech Terrace, Box Walk, and Rose Garden. A riotous variety of roses fills this sunny space between the Urn and Fountain Terraces. A wisteria-covered arbor opens onto a sunny terrace overlooking the lower gardens. The story of a terrier given to a Neapolitan girl by a French admiral inspired this column. A shallow pool sits at the bottom of a small brick amphitheater, bordered by a stand of bamboo. This narrow brick walk wends through a dreamlike woodland spotted with daffodils and hyacinths. These large flowerbeds explode with color the whole year round. Apples, cherries, pears, and plums blossom and bear fruit every year in this small orchard. The plum trees on this walk guide a visitor through the Kitchen Gardens. This area includes a cutting garden for flowers and a working vegetable garden. Hidden near the edge of the gardens, Lilac Circle offers a secluded spot for rest and contemplation. When the trees blossom in springtime, this hillside becomes one of the gardens’ most magical spaces. This small shelter at the edge of the gardens now houses educational displays. Blooming forsythia turns this corner of the gardens bright yellow at the beginning of spring. A double ring of hornbeams encircles a fountain, creating a hypnotic sense of calm. This gently descending staircase, flanked by boxwood hedges, is the gardens’ central axis. Elaborate stonework and low flowerbeds play off trellises of wisteria in this stately courtyard. Farrand planned to feature a variety of similar blooms en masse here. Elegantly tapering walls project a grand view from the steps of the historic house. Swirling brickwork surrounds a Japanese maple just outside the museum. This small room features custom stonework, wrought-iron furniture, and a fountain ornamented with various constellations. The swimming pool and beautifully decorated loggia attest to Dumbarton Oaks’ history as a private residence. The brick and limestone ribbon walks simulate the quality of flowing cloth.